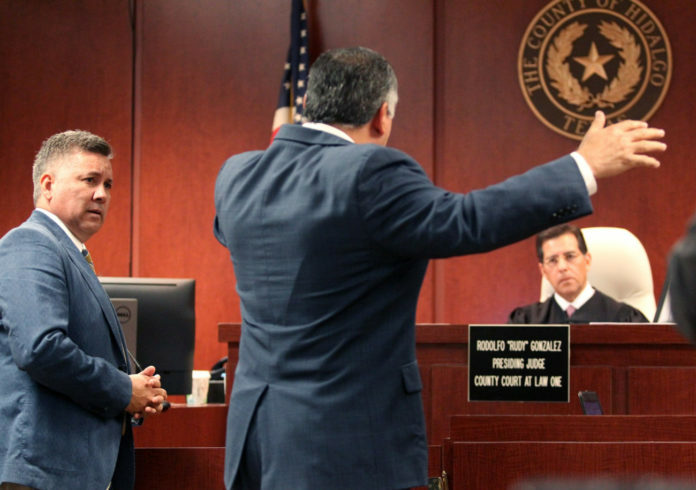 EDINBURG — Hidalgo County Court-at-Law Judge Rodolfo “Rudy” Gonzalez will likely decide Friday whether the school district here misused taxpayer funds to promote the passage of a $220 million bond after spending nearly five hours Thursday listening to both sides argue their cases. Attorneys, and brothers, Javier Villalobos and Jesse Villalobos represented Jane Cross and Jerry Rivera in their temporary injunction petition against the Edinburg Consolidated Independent School District and its superintendent, René Gutiérrez. Kevin O’Hanlon and Juan “Sonny” Palacios defended the school district. The Villalobos brothers argued the district advocated for the bond’s passage by printing a brochure that included “persuasive” and “enticing” words, accused administration of pressuring teachers to attend mandatory meetings about the bond, claimed two board members directed Gutiérrez to hire a marketing firm to “electioneer” in favor of the measure, and said the district ultimately used taxpayer money to advocate for it. O’Hanlon and Palacios argued the district kept a close eye on the language of the material, which O’Hanlon said he vetted on several occasions before the district printed it, and insisted the material was merely an informational pamphlet to help educate the populace. The petition was not filed to stop the bond election in May, but to show that the district was “putting a thumb on the scale,” the Villalobos brothers said. School district attorneys, however, argued the lawsuit was a political move to taint the election. The hearing drew a large crowd early on that included a number of school board members, district employees and supporters for each side, including former Edinburg mayoral candidate and district employee Gina Alamia, ECISD Police Chief Ricardo Perez Jr. and district spokesman Roy Cantu. 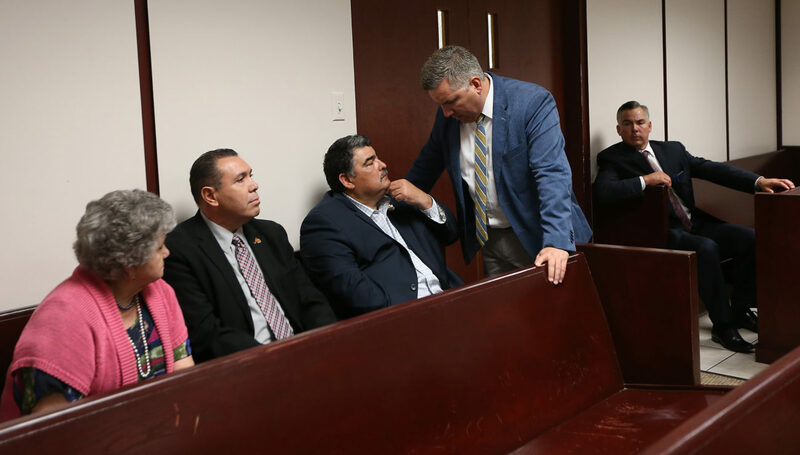 Three board members took the stand — Farias, Carmen Gonzalez and Oscar Salinas — as did Gutiérrez and Cross, but not before the attorneys argued whether the court had jurisdiction over the case. 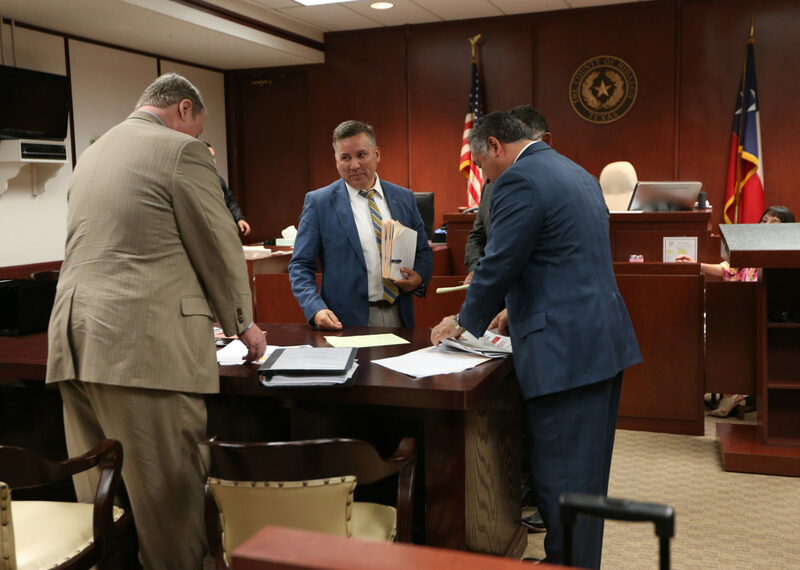 Palacios and O’Hanlon argued the Texas Legislature gave authority to the Texas Ethics Commission to rule on possible ethics violations to the election code, but the judge disagreed and heard the arguments. He also argued it contained information that was not factual in reference to enrollment figures and trends and said it amounted to providing “selective facts” that were meant to “entice” the public to vote in favor of the measure. ECISD attorneys argued those words did not meet the legal definition of advocacy. “Enticing words are not enough, the question is (have they) expressed advocacy,” Palacios said. At one point, Gonzalez appeared to agree with the district. “I don’t see anything that’s glaring,” the judge said about the pamphlet. “‘If approved’ provides the only indication toward voting, but information is provided afterward. “It’s not saying do it or don’t. It says “if.” That to me would be an indication, we’re gonna let it, leave it to the community, and let the voters decide,” Gonzalez said. Farias also testified that the superintendent told him he was given a directive by two board members — Salinas and board president Robert Peña — to hire Absolute Business Consulting Group and insinuated they ordered Gutiérrez to forge a contract with the company that would cost the district less than $50,000 because that would allow Gutiérrez to sign off on it without board approval. 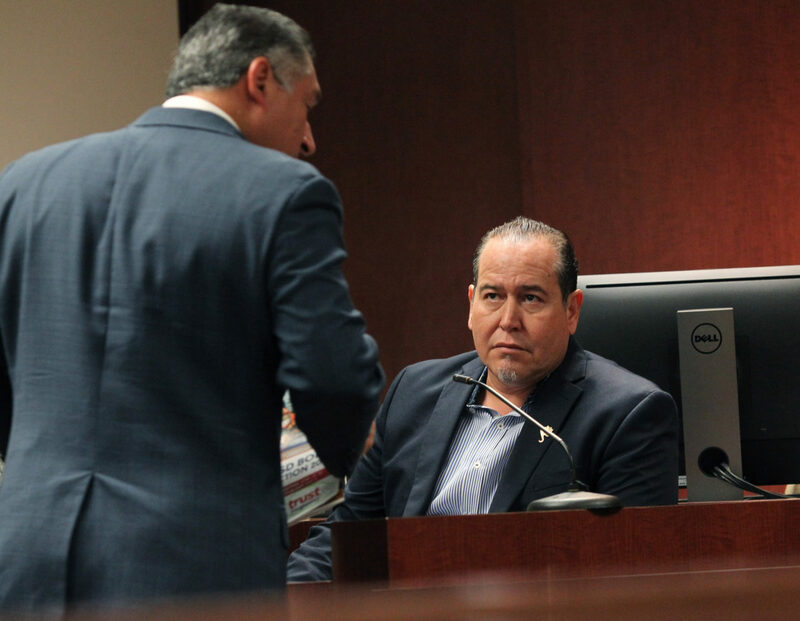 Gutiérrez testified Salinas introduced him to the company — which is run by well-known political consultants Karina Cardoza and Mike Robledo — but said he was not threatened or directed to do so. He also went on to say that other board members, including Farias, have introduced him to vendors, calling it a commonplace practice. 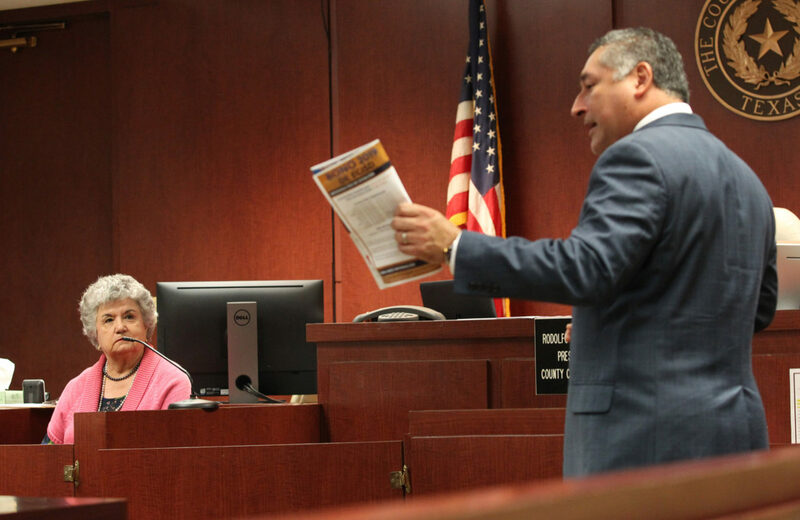 The $45,000, five-month contract was forged to help disseminate information about the bond and to help the district recruit students before classes begin in August, Gutiérrez said. Marketing the district to parents and students is important as charter schools compete for enrollment, which is an issue many other districts face in the area, school district attorneys argued. The contract might have included the bond, but it was not the focal point of the hiring, Gutiérrez testified. Gutiérrez testified he was not aware of any mandatory meetings held solely in reference to the bond, and indicated the principals at the schools call the meetings and decide what items will be up for discussion. As superintendent, he does not have complete control of every school or principal, he said. The Villalobos brothers tried to introduce emails about mandatory meetings during school hours, but Palacios and O’Hanlon successfully objected to it because they weren’t sent by the superintendent and they did not specify the meetings were meant to discuss the bond. The plaintiff’s attorneys argued district employees were scared to come forward and testify. Gonzalez asked both parties to submit proposed orders for him to evaluate and consider by noontime Friday. If he receives them by that time, he’ll have a ruling by Friday afternoon. If not, both side will have to wait until Monday for a conclusion to the case.